Sai Tour & Travels have come up with a special offer on taxi service. Book a ride with us, get special discount and ride at ₹8/km. It is our best offer till date. 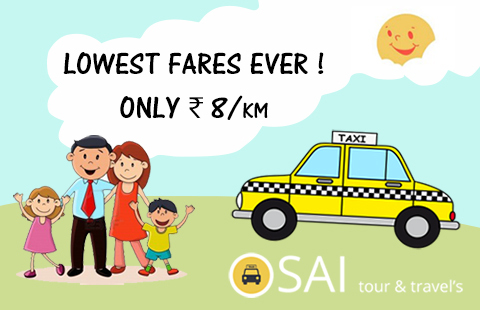 Now travel anywhere in India with your loved ones and book a ride with ₹8/km. It’s the best chance to travel to the famous tourist destinations like Shimla, Manali, Leh Ladakh, Amritsar, Wagha border and many more. We guarantee to make your each & every moment memorable. We believe in 100% customer satisfaction. This offer is valid on all the tour packages available on our website. You will also get this offer on your own custom made tour plan. So what you are waiting for, pack your bags, book a ride and explore the famous destinations with your family and loved ones. This offer is only for a limited period of time. Go ahead and grab the offer.